She initiated the perfect question seconds before my usual instructions. I thanked her profusely as she set the bags in my cart. In the parking lot, as I hoisted the four bags into my car without strain, I further appreciated how well she had balanced the weighty apples, potatoes and squashes with the kale and rainbow chard selections. Whereas I was thankful in the moment, the effects of her careful effort deepened my appreciation and had a lasting effect. In this season between Thanksgiving, Chanukah and Christmas, much is written about gratitude and “giving” to show appreciation. We are bombarded by requests from charities and organizations. Budgets are reviewed. Lists of relatives and friends, people we love and care about, organizations, which focus on attending to issues and causes important to us, are made. Every person or organization we choose to acknowledge, in some way, makes a difference in our lives. Is not the act of making a gift list the same as making a gratitude list with a specific intention? My mailbox is situated up the driveway by the side entrance. It requires the mail carrier to walk from the street to the mailbox every day, through every season. During warm months, I’m often in the garden and can greet him and sometimes, chat. In this season of chill, I see him little but will enjoy selecting a special card, writing a note of appreciation, and adding a gift to leave in the mailbox. Appreciation, the practice of gratitude, takes time and effort. The person who best exemplifies this in my life is my daughter, Beth. Joined by her daughter, she has the ritual of making home made chocolate fudge and pretzels covered with chocolate and colorful sprinkles. The ritual began years ago as a way to raise funds for a school charity and since, has grown into a way to show appreciation for colleagues, friends and family. Her Dad is on the list. She makes him special turtles with caramel. I order fudge and pretzels, festive packages for special friends. I plan to start my appreciation/gift-giving list tonight, at the onset of Chanukah. 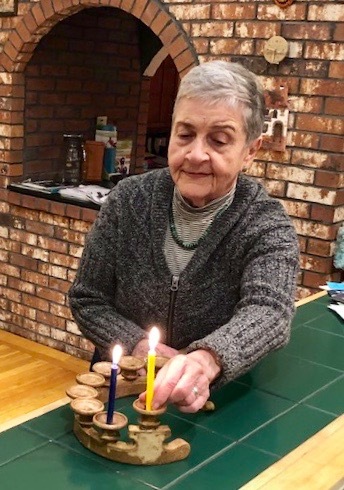 As I light candles on the eight nights, I am grateful for my home, my family, my friends, my colleagues, my neighbors, my many helpers, my news outlets, the flow of information, my opportunity to be engaged and give back to all who help make my life better and safer. This entry was posted in Creativity, Currents, Happiness, Mindfulness, Relationship(s), Uncategorized, Well-Being, Writing and tagged Gift giving, gratitude list, Hanukkah on December 3, 2018 by fayewriter.